The Academy of the Sacred Heart and the Rosary Sacred Heart Alumnae Association are pleased to announce Nancy Finegan Walshe '88 as the 2018 Alumna of the Year. Established in 1976, this awarded is presented annually to an outstanding alumna who demonstrates devotion and loyalty to her alma mater. 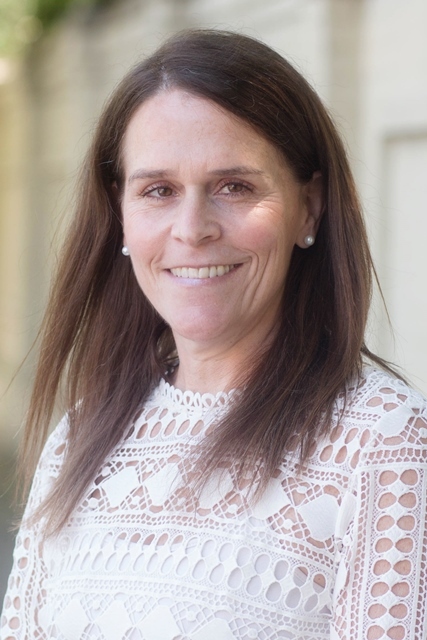 The Alumna of the Year models a faith life consistent with the values of Sacred Heart education, has made outstanding contributions to the school, and manifests an interest in, and support of, the whole school. Nancy Finegan Walshe '88 has been involved with Sacred Heart almost her entire life. She spent 14 years as a student, graduating in 1988. During her senior year, Nancy served as student body President. She graduated from the University of Alabama in 1992 and returned home to New Orleans. Nancy worked as a pension administrator for Business & Professional Consulting Services until it was time to return to Sacred Heart—this time, as a parent, volunteer, and alumna. Nancy stopped working in 2003 when her daughter, Katie Grace, entered nursery. During Katie Grace's 15 years at ASH, Nancy volunteered extensively. She served as Auction Chair and as a Room Mother; ran the String Pull and Cake Walk booths at Congé; organized Tuesday Tours and Open House; served lunch at the Mater Campus; helped decorate both campuses for Christmas; and volunteered in both campuses' libraries. During the Hurricane Katrina school year in 2005-2006, she headed the clean-up of the Mater Campus kitchen and helped every Thursday with the short-handed Toddler 2 team. Nancy was also heavily involved with the Rosary Alumnae Association, serving as a Board member and as Treasurer for over 10 years. During that time, she worked every Alumnae Weekend, Bingo Night, Santa Party, Baby Party, and Alumnae Induction, as well as several Home Tours. Nancy has been married to her husband, Michael, for 22 years (they were married in the Rosary Chapel). Not to be outdone by his wife, Michael served as a member of the Sacred Heart Board of Trustees for nine years, chairing the Legal & Insurance Committee the entire time. In addition to Katie Grace, now a freshman at Loyola University Chicago, Nancy and Michael have a son, Michael III, who is a junior at Newman. As Nancy enters this next stage of her life, she's returned to the workforce, part-time, as an employee of the Roth Law Firm and Strata Services LLC. But she'll never be far away from Sacred Heart. What does it mean to you to be the Alumna of the Year? When I heard I was alumnae of the year, I was simply blown away. Sacred heart is such a tremendous part of my life—14 years as a student, 15 as a parent, and just this year, 30 as an alumna. To be honored and recognized by a place that means so much to me is truly a blessing. Sacred heart has always felt like a second home. Walking through those gates is as comfortable to me as walking through my front door. It's where I was practically raised, it's where I met the people that to this day I call my closest friends, and it's where I watched my daughter grow into the amazing person that she is today. What is your favorite Sacred Heart memory? My favorite sacred heart memory has to be graduation night—no one does it like we do. The dresses, the gloves, the wreaths—it's just beautiful. Having spent that night with the 51 girls I'd grown so close to, all of us hugging and crying, was truly special. Watching my daughter and her 64 classmates do the same thing 30 years later brought back those memories and reinforced how special Sacred Heart is. How did your Sacred Heart education help get you where you are professionally? Sacred heart taught me so much independence and how not to be afraid of speaking in a group or standing up in a crowd. I've never been too shy or uncomfortable to speak up in a class or a meeting or a seminar. Outside of academics, what about the Sacred Heart experience uniquely influenced who you are today? My friends, my comfort group, to this day are still the people I graduated with 30 years ago. We have all had our ups and downs, and without each other, I don't think any of us would be where we are today.